With conscientious use and some strategic changes to your home, it’s possible to cut back on air conditioning to save money without sacrificing your comfort. Cooling appliances use a considerable amount of electricity, but when you stop the heat from entering your home, it won’t have to work as hard. Instead of making yourself remember to turn the thermostat up whenever you leave for the day, install a programmable thermostat to do the remembering for you. There’s no need to keep your home as cool when you’re away. You can use that energy you saved by turning it down when you return. You can set the program to start cooling shortly before you arrive, so you don’t come home to a warm, stuffy home. A smart thermostat will also give you the opportunity to monitor your home’s temperature and change it from anywhere. This feature is useful if someone is coming home unexpectedly, or your return will be later than usual. Ceiling fans don’t actually lower the temperature in a room, but they do increase the comfort and help you cut back on air conditioning. Moving air always feels cooler because it speeds the evaporation of moisture from your skin. Make sure that your fan is set to run counterclockwise in the summer so that the air will flow straight down and keep the space cool. As you select the fan, be sure to measure the room first and base your choice on room size. If the ceiling isn’t blocked for a fan, you may want to hire a professional to install and wire it for you to ensure a safe installation. Closing the window coverings will help you cut back on air conditioning on the south and west facing windows. For the best protection, use thermal window coverings like heavy drapes or cellular shades for the best heat rejection. Keeping the sun out of your home will prevent it from heating up during the day. Going through your home looking for any air leaks will help you cut back on air conditioning. 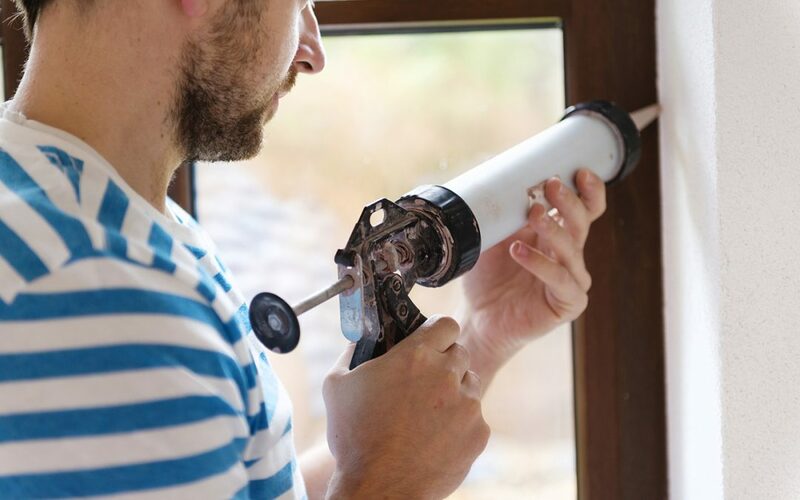 Outside, look for cracks and gaps around window and exterior door frames and fill them with caulk. If you see daylight between the exterior doors when you’re inside, you may need to apply fresh weatherstripping to form a tight seal. Be sure that the fireplace damper is closed and fits tightly. Over time, the damper can warp and allow air to escape through the chimney. You can use an inflatable chimney insert to seal the chimney when it’s not in use. Recessed lights that protrude into the attic often have extensive air leaks or lack of insulation. If there are visible wires, you may want to hire an electrician to insulate and seal them. Blueprint Home Inspections conducts professional home inspections in the Central Valley of California for home buyers, home sellers, and homeowners. Contact us to schedule your appointment.